Jackson Dwyer was born in Montréal, Québec. 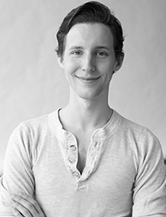 He trained at John Cranko Schule in Stuttgart, Germany and Canada’s National Ballet School. Mr. Dwyer joined The National Ballet of Canada as an Apprentice in 2010 and became a member of the Corps de Ballet in 2011. Mr. Dwyer’s repertoire includes Cinderella, The Nutcracker, Don Quixote and Onegin. He also danced in the company premiere of Christopher Wheeldon’s Alice’s Adventures in Wonderland. Mr. Dwyer was a NFAA YoungArts Week Finalist and received a Peter Dwyer Award and the Lawrence Haskett Scholarship.